It took me a few days to figure it out after reading many blog posts that were only helpful in setting up prior versions and appeared to be carbon copies of each other, but I hope my post will prove to be a little more accurate than the others. Please note these instructions are specific to MongoDB version 2.6 and Windows 8.1, and this is what worked for me. 1. Download the source files from The Official MongoDB website and get the Windows 64-bit zip or msi version. 3. Create a data directory to store the database data (e.g. C:\MongoDB\data\db). 4. Create a log directory to store the log files (e.g. C:\MongoDB\log). If you want to learn more about your configuration options, the official documentation can be found at the MongoDB website. Note that it is only starting with version 2.6 that you can use YAML markup. Prior versions use a different syntax. 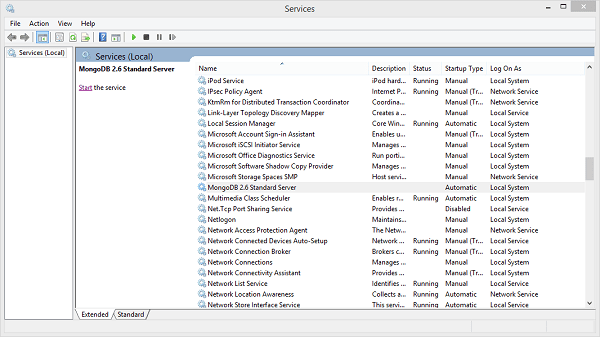 Or type in services.msc at the command prompt to bring up the Services GUI. You can Start/Stop/Restart the service from here. If you get an Error 109: The pipe has ended when stopping the service, you can safely ignore it. It’s just a cosmetic error according to my research on the web, and I noticed that I only get it if I start and stop the service immediately. I didn’t get the error after the service had been running for a while. You should also be able to use the same methodology if you’re having problems with other versions of Windows and MongoDB as well. 1) The \data\db directory exists and is being pointed to correctly in the configuration file. 2) The \log directory exists and is being pointed to correctly in the configuration file. 3) You do not use sc create to install to a path that has spaces. This is a bug that was brought to my attention on StackOverflow and documented in JIRA. Note: A day later, I discovered this official documentation on MongoDB’s website. I haven’t tested it yet, but you can try escaping the string by adding “\ to encapsulate the spaces in the path if you do want to try to install to a path with spaces (e.g. Program Files). Previous PostPrevious Welcome to The Troubleshooting Center! Next PostNext Ajax Control Toolkit Not Working?